Restore the backed up files and folders whenever needed at original or desired location. Backup Express will backup all your important files and folders automatically at safe locations daily, weekly and monthly.This software will automatically take backup of important folder and files at safe place.You need not remember to take backup. 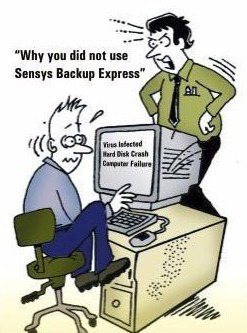 Software will remember and do it for you and whenever required Backup Express will restore these file for you. Backup Express helps you protect important files and folders from loss and damage because of accidental deletion. Backup unlimited files, folders, directories anywhere on your pc or network, even if they are open. Backup can be pre-scheduled and it will be saved automatically on the desired path. Backup E-mails from Outlook Express, Microsoft Outlook and Address Book. Backup with compression or without compression. Backup to hard drive, any removable storage media or sever. Completey Secured and Password Protected. Inbuilt daily, weekly, monthy schedule feature for Auto Backup. Detailed logs and reports about backup. E-mail these status reports. Sensys Technologies is the established Developer and Supplier of advance range of Taxation & HR related software products on TDS, XBRL, Payroll, Web based Payroll, HRMS, Payroll Software as a Service, Fixed Asset, Service Tax, Income Tax, Digital Signature, PDF Signer, Databackup & Attendance Machine. Today, we have mustered a huge clientele due to our streamlined business operations and effective and feasible solutions. We aim to achieve complete client satisfaction & are building this company for the long term - a profitable company that is highly relevant to its clients, supportive of its people, and respected in the marketplace. Sensys Technologies was formulated in the early 2004 with the vision of offering quality solutions in Software and Internet. The operations of the company began from April 2004. The company has been promoted by technocrats with experience in the IT field for more than 5 years. Our work so far has been in the orientation of our clients to their business communities by providing impressive presence. The company has worked on internet technologies to accelerate client requests and data processing over the Internet. In a short span of time the company already has a respectable clientele to its credit. We are Technically strong and experienced team, with ability of managing business growth. Potent combination of strong and ambitious management team, very strong delivery capabilities of innovative software solutions have enabled growth in revenue over the past five years. We are building this company for the long term - a profitable company that is highly relevant to its clients, supportive of its people, and respected in the marketplace.